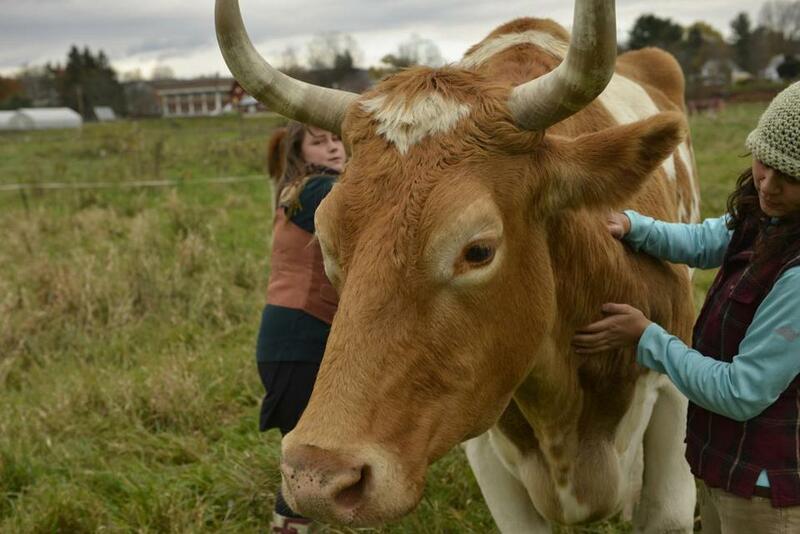 Lisa Wilson (left) and Meiko Lunetta tended to Lou, one of the two oxen that Green Mountain College wants to slaughter. The setting is peaceful, but the scene at Green Mountain College in Poultney, Vt., is anything but that. A storm of protest that greeted the school’s decision to slaughter a pair of 10-year-old oxen that symbolize its farm program and then serve their meat in the campus dining hall has spread. Surrounding slaughterhouses were so inundated with hostile e-mails and phone calls, the school said, that Green Mountain is postponing the deaths of the oxen, Bill and Lou. The college has continued to be pummeled by phone calls, e-mails, and Facebook postings. “They’re putting the heat on and not in appropriate ways, in my view,” said Philip Ackerman-Leist, director of the school’s farm and food pro­ject. Nearly 4 million e-mails from a single unknown domain blitzed the school in mid-October. Now demonstrations are planned for Friday and Saturday on the edge of campus as Green ­Mountain prepares for open house events Saturday. “I work for the admissions department and will be leading tours of the farm, so things should be interesting,” Green Mountain senior Alison ­Putnam said Thursday. Green Mountain, a liberal arts college with 680 undergraduates (30 percent are vegan or vegetarian), seeks to teach small-scale farm production that is ecologically, economically, and socially sustainable. The school remains steadfast in its decision to slaughter the oxen, which was finalized in an ­October campus forum after Lou reinjured a leg and was ­unable to continue working. “When we find an appropriate slaughterhouse and we get a date, then we’ll go forward,” the college’s president, Paul J. ­Fonteyn, said this week. The school has not publicly discussed when or where the slaughter would happen. About 15 protesters gathered near the school a couple of weeks ago. Exchanges between students and protesters were heated at times but for the most part civil, said senior Meiko ­Lunetta, who supports the decision to slaughter the oxen. The Friday and Saturday protests are being promoted by People for the Ethical Treatment of Animals, or PETA, which is helping local activists organize it, said Lindsay Rajt, associate director of campaigns for the vegan organization. She expects some Green Mountain students to join the protest. Fonteyn, provost at the University of Massachusetts Boston for six years before his arrival at Green Mountain in 2008, said that on one occasion, two people came to campus, demanded to see him, and then appeared to take pictures of him after being turned away. The animals, “worked for us,” he said. They were not pets. They were not mascots. They were working oxen on the farm. They’re now going to go on to the next stage. Steven Fesmire, professor of philosophy and environmental studies at the college, said dozens of messages he received have been deeply disturbing. “But dozens have also been very civil and thoughtful, showing that people can reasonably disagree about this matter,” he said. Many have simply begged for the animals to be spared. “Please save Bill & Lou. Please have mercy,” read a posting on the college’s Facebook page. On campus, the dialogue has been mostly constructive, said Putnam, who supports the decision. “When the farm was ­established, a variety of students, including vegetarians, wanted animals to be raised for meat to show students another step of where their food comes from,” she said. School administrators said they look forward to things return­ing to normal. The heavy flow of e-mails to faculty members has made it hard for students to communicate with professors, Lunetta said. Kimberly Blank, a Green Mountain senior, said she had opposed the college’s decision, but is now on the fence because of the outpouring of negativity. Bill Porter can be reached at wporter@globe.com.